Yesterday morning I decided to see how much time I have before fuel starvation after my sight tubes go dry. At 15 miles from the field I was emptying my right tank. I flew for a few minutes using the right tank after the last of the fuel disappeared but not until starvation so there was still something left on the right side. The left side then emptied very quickly and I appeared dry on both sides at still 12 miles to go. I full expected to dead stick the landing but the engine ran for the approach, landing and taxi. In my hangar both tanks appear dry. Ed, I recall draining my fuel tanks during one of the wing removals. I drained until I couldn't see fuel in either sight tube and stopped the drain. I then opened the drain on the gascolator and timed until all fuel stopped draining. I recall going for well over 5 minutes and perhaps close to 10 minutes before the fuel stopped draining, albeit the flow became a trickle towards the end. I also recall seeing a damaged CTSW which had the pillars torn apart. I recall the fuel tubes inside both of the "A" pillars were not just a 5/16" diameter but were large (about 3/4"?) diameter tubes. This, combined with the fuel remaining in the lines from the firewall to the engine provide a good amount of time before fuel starvation occurs. Perhaps this is intended to provide added capacity for emergency fuel and may be a reason the engine continues to run even though one (both in your case!) sight tubes show "empty". I am not totally sure all I've said is accurate and would welcome comments from someone who is familiar with the "A" pillar structure and/or who has timed how long it takes for the fuel to run dry after showing "empty" on the sight tubes. One dry tube is off no little concern to me, I only install fuel in my left wing 90% of the time. Two dry tubes is another story. Your ability to make it to touch down with engine still running eventhough both tubes showed "dry" 12 miles out make me think there is a good amount of fuel remaining in the "system" below the sight tube point. Even if this is true, this doesn't do much to alleviate the "pucker" factor! I did a test something like yours as part of a sight tube calibration years ago. I believe my engine idled for 20 minutes on the ground after the last fuel was visible. Warning: Your mileage may vary. My idle is only about 1600 rpm. 20 min at idle is very little time at power. You should not depend on this as a fuel reserve. I am always on the ground before either tank shows empty in straight and level flight. I don't believe anyone else should be flying around with an empty tank either (though Ed can do whatever he wants). Mike, totally agree. Although I've never run the fuel down this far, the minimum fuel I will fly with is when the combination of both tubes show 6 gallons. I'll be on the ground refueling at this point. @Mike Koerner I agree as well. I'm certainly reluctant to broadcast that I got this low but I find the info so useful that I am sharing it. Returning to Mammoth from the sierra at 14,000' does permit me to play glider pilot. On this day I could have landed in Lee Vining and beyond that I could have flew direct to the field but I always had Mammoth made and an alternate if I came up short. Death wish . . . I just don’t see the “payoff” there. payoff is skill development and skill maintenance. If I tell you about coming home in the Europa which is an armature built motor glider but in this case with short wings and a performance envelope roughly like a CT and high speed gliding with motor off for the last 100 miles it somehow seems reasonable. I often come home with a lot of altitude to loose so I can test my skills with minimized risk. I have a couple of emergency landings in my past and like the ability to deadstick without a lot of stress because I'm current. Your Europa example is apples and oranges. 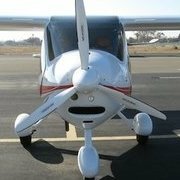 There is a difference in turning the engine off to glide in an airplane designed for that, and running an airplane out of fuel. I think it would be bad practice to run the motorglider out of fuel too, or to land with the engine off. Too much opportunity for mishap.